With the emergence of Reza Shah and the Pahlavi dynasty in the mid-1920s, the desire of Iranians to control their own national bank and curtail the influence of theBritish led to establishment of the Bank Melli Iran (National Bank of Iran). By 1932 the right of the Imperial Bank of Persia to issue banknotes had been withdrawn. Few researchers have examined the subject in detail, and general references often have inaccurate information. The following study by Michael Bonine attempts to fill in some of the gaps and includes an analysis of several hundred lower-denomination banknotes. Michael E. Bonine (1942–2011) was an active member of the University of Arizona’s Departments of Near Eastern Studies and Geography, and founding director of Arizona’s School of Middle Eastern and North African Studies. He published extensively on the human and physical geography of the Middle East. He also turned his hobby of collecting into a scholarly activity as he systematically acquired banknotes of the Imperial Bank of Persia. 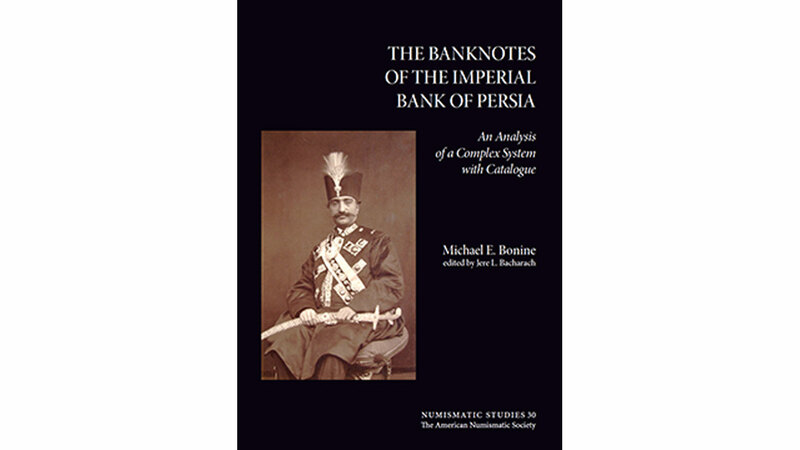 Extensive research, particularly in London, and painstaking studies of the eighteen denominations printed for the twenty-eight bank branches resulted in this monograph on the Imperial Bank of Persia banknotes.